The idea of becoming ordained happened quite abruptly. I was already in my 50s. I liked putting on make-up in the morning and looking at myself in the mirror. I was wearing lipstick, eye lashes, whatever, you name it. I enjoyed looking beautiful. I had enough of the flashy life. Emptiness. I thought, this life is a push-button system. But I was not the one who was pushing the button. You know, at eight o’clock I had to be here, nine o’clock somewhere else. I was not the one who actually planned to do it. I had to be jumping around as if someone else was pushing the buttons. I needed to lead my life with the quality of my choice. People always say, you are very brave to do what you have done, because I was the only one woman [monk] in this country. But I didn’t feel that way. I didn’t feel one bit that I was brave. I felt as if it was a normal thing. This is part two of Mama Asia, a long-form journalism series in which Sally Sara meets 12 inspirational Asian women. I’m sitting in the back of a taxi on the way to a Buddhist monastery outside Bangkok. I will be living with the monks for the next seven days. This won’t be a travel brochure kind of spiritual experience. I know the monastery is on a busy highway in a poor neighbourhood. There will be more car horns and exhaust than dolphin music and scented candles. The other thing I know is that the leader of the female monks is a tough character. Before she was ordained, she was a high-profile academic with her own talk show on Thai television. Her nickname was ‘Stone’ because she was so hard. She was sharply dressed and had painted fingernails that would make a Kardashian look twice. Now, all that has changed. The glamorous professor has become a Buddhist monk ? frugal with her possessions but not her ideals. I peel myself from the sweaty, sunken seat of the taxi as I arrive at the monastery. Several dogs greet me with half-hearted barks, the kind only contented dogs can give. They lazily zig-zag around my feet as I walk towards the entrance. I slip off my shoes and place them in a rack near a small gate. Ceiling fans hum in a large open-air dining room with a sharply pitched roof. The female monks are all outfitted the same, with mustard coloured robes, bare feet and shaved heads. But it’s easy to see who is in charge. Venerable Bhikkhuni Dhammananda walks towards me; she’s tall for a Thai woman, her build is strong and straight. I’m not quite sure how to greet a monk. I clumsily clasp my hands together, prayer-style in front of my face. She returns the gesture, gracefully. She’s had plenty of practice dealing with people who don’t quite know how to react. It’s only mid-morning but it?s almost time for lunch. Ven. Dhammananda explains the monks don’t eat after midday because they don’t wish to appear greedy. Much of their food is donated by families in the neighbourhood. I’ve come prepared, in case I get hungry. Every time I move my backpack, I can hear the crinkle sound of the packets of biscuits I’ve got stashed inside. I feel like some kind of junk-food smuggler. The monastery dogs eagerly sniff my luggage. Venerable Dhammananda gives me a knowing look. The deal for the next week is that I will live, eat, work and pray with the female monks. Every afternoon, Ven. Dhammananda will meet me in the library for an hour so I can interview her about her life. I’m given the rules for my stay – don’t kill any living creature, don’t speak falsely, don’t take what is not given to you, don’t commit sexual immorality or become intoxicated. Unless a Hollywood bad boy drops in for some rehab and a spiritual awakening, I’m guessing there won’t be any temptation. I’ve got the monastery guesthouse to myself. The ceiling fans rotate at helicopter speed. I lie flat on my back on the neatly made bed and doze, while the monks quietly study during the hottest part of the day. By late afternoon, I join the monks working in the garden. I scrape up leaves from the lush trees, with a cheap plastic rake that bounces over the ground. My arms are glistening with a mix of sweat, mosquito spray and sunscreen. As I work, I hum my nanna’s favourite song, Can’t Help Lovin’ Dat Man. I’m off in my own world. It’s not until I stop raking that I realise the monks are working silently and dutifully. I’m a bit embarrassed. ?We don’t know which one comes first – the next life or tomorrow. Has it ever occurred to you? We don’t know when we are going to die – it could be tonight.? After the gardening is finished, I follow Ven. Dhammananda to the library. As she talks, I can get a sense of her past and present blending together. Left to her own devices, she is naturally quick and even impatient. But her faith has tempered her. She explains that as a Buddhist she needs to keep her mind positive. Not just in theory but in reality, moment by moment. “His Holiness, the Dalai Lama said, ‘we don’t know which one comes first – the next life or tomorrow.’ Has it ever occurred to you? We don’t know when we are going to die – it could be tonight. “The minute before you pass away is very important in our Buddhist practice because that minute or that second when you are departing, if you are holding onto something good, good thoughts, then you go to the good place. Unless we practise on a daily basis, on an hour-to-hour basis, we cannot be sure that when that minute comes that we will go that direction. But keeping peaceful thoughts hasn’t always been easy. Ven. Dhammananda was the first woman in Thailand to become an ordained Theraveda Buddhist monk. Theraveda means ‘doctrine of the elders’; it?s one of the largest movements in Buddhism and is popular in countries including Sri Lanka, Cambodia and Thailand. Ven. Dhammananda?s decision to seek ordination was hugely controversial. She was criticised by conservative Buddhist leaders, who said it was wrong for women to wear the robes. Ven. Dhammananda had to travel all the way to Sri Lanka for the ceremony, because no male monk in Thailand was willing to conduct it. “I knew exactly what I was doing so I never wavered when people said something. There was not one single monk who would tell me in front of my face. So I said, anyone who speaks behind my back, that is considered unsaid. You have to come and speak to my face, then I will explain to you. Ven. Ven. Dhammananda’s mother, pioneering educator Voramai Kabilsingh, established this temple in 1960. She was a strong, strident woman who followed her beliefs rather than convention. She rode her bicycle all the way to Singapore in the 1930s, as the only female member of the local Scout troop. Voramai was educated by Catholic nuns. She was passionate about education and faith; she published a Buddhist newsletter from a homemade printing press and set up a makeshift school in her house for nuns and monks who were uneducated. She shaped Ven. Dhammananda?s childhood more than anyone else. “We slept together on a cotton mat. I would fall asleep watching her writing. That is my first picture of my mother, always a writer. “My father, he was a politician. He did not stay with us; he belonged to the south, so most of the time he would be down south and he would come up only when the parliament was open. “We lived in a small house in Bangkok. My father was well-to-do but when we moved in, we moved in on our own. He was not supporting us. My mother was the only breadwinner. Two years later, Ven. 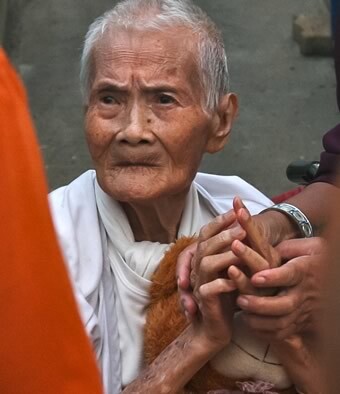 Dhammananda’s mother took the first steps towards lower ordination, as far as a Thai Buddhist woman could go in the 1950s. “She didn?t tell us anything. She was not the type to discuss anything with her kids. She was not the kind of mother who would talk with you and play with you. It was very strange but none of us spoke. We were inside the barber shop, we were waiting for her. There was no communication. I guess we were all stunned I think. I was feeling strange and I was conscious that people were looking at us because my mother was having her head shaved. “She said, ‘My duty as a mother does not stop with my ordination.’ This is a very profound sentence because men, when they receive ordination, they always leave their families. But, if my mother had left us I would have been a street kid. So instead she turned the household into a temple. I was 10. I like to be a feminist but I like to be a happy feminist. I cannot be an angry person. It was the first temple in Thailand built by women, for women. As an adult, Ven. Dhammananda supported the project but was also establishing her own career. She taught religion and philosophy at Bangkok’s most prestigious university for 32 years. In 1983, Ven. Dhammananda was invited to speak about Buddhism at a women’s conference at Harvard University in the United States. It was a turning point. She wanted to bring many aspects of feminism back to her homeland. But, she could see a big gap in culture. She could also see it was time to stop writing about Buddhism and start practising it. “That conference was full of mostly feminists, very strong feminists, lots of anger and lots of crying and weeping. Some of the strong-headed feminists had been put in prison for many years. I agreed with the cause of what they were doing but I didn’t want to be like them, I didn’t want to be angry. “I like to be a feminist but I like to be a happy feminist. I cannot be an angry person. If I am angry, what I am doing is to shoot out negativity from me and it’s not healing you, it’s not healing me. That’s the kind of battle Ven. Dhammananda has been fighting. She didn’t read the local Thai newspapers for two years because the media campaign against her ordination was so strong. Instead, she decided to lead by example. But that’s a big challenge for a woman who is so determined and driven. “I thought anybody who could not keep up with me was too slow, until I realised I had been moving all by myself – I needed to move with the group. If I am teaching my community to move with me, I need to be with them. That is the greatest training and that is the most difficult thing. “You see, some people who work on social causes, they have breakdowns because they see so much injustice – there is a lot of injustice done to women. “I see a lot of feminists who are unhappy; they are shouldering the suffering of the women of the whole world. The monks start the day with meditation, before dawn. They sit in rows in a small room upstairs. Their backs are straight and their eyes focused forward. I’m given a cushion, because the floor is hard. I can hear the hum of early-morning traffic on the highway outside as the monks start chanting. The sound is gentle and rhythmic, it folds over itself syllable by syllable. I’m not quite sure what I’m supposed to be thinking. My mind swirls and wanders. I’m hungry. Rather than going deep into meditation, I’m thinking about lamb chops. Ven. Dhammananda looks over at me as I change my sitting position on the floor, because my movement is distracting. Morning after morning and night after night, I do my best to chant along. But meditation eludes me completely; instead it’s Eat, Pray, Chops. That afternoon, I confess to Ven. Dhammananda, that I’m not really having a spiritual awakening during the chanting. She smiles and admits her mind wanders sometimes too, but when it all works well, it’s worth the wait. It’s Mother’s Day. Local women are coming to the monastery to have lunch and receive blessings. Later in the afternoon, one of Ven. Dhammananda’s adult sons pays a visit. He greets her warmly but respectfully ? she is mother and monk to him, the mothering hasn’t stopped. Later that afternoon, when we sit in the library, Ven. Dhammananda explains her decision to leave her husband and seek ordination. “My husband was not angry but confused maybe. I think the time had come where I had to choose my life, what was meaningful for me. Ven. Dhammananda has told her story many times but she is patient with my questions. For all her strength and toughness, there is vulnerability. She says that before she was ordained, she was desperately lonely, even though she was surrounded by her family. Something was missing. Being a wife, mother and professor wasn’t enough anymore. “One night, I was waiting for my sons, they were all grown up. It was about six o’clock in the evening. I was living in this big house and I was stretching my neck, looking out the window, waiting for them and wondering when they would return. I thought, no, this is not going to be my life. “In Buddhism we talk about renouncing the world. Suppose I waited until I was 60 and I didn’t renounce. That is not renouncing. You have to be at the height of the material world and then you leave – that is renouncing. The sunrise on Saturday morning is rumbling red, the air is already hot and humid. 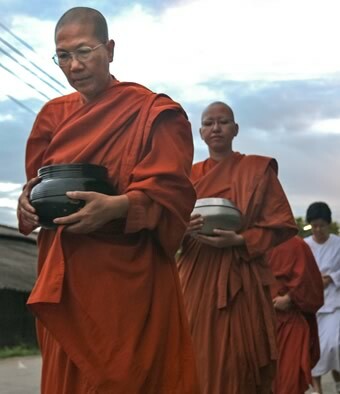 The monks and nuns have freshly shaved their heads, ready for their weekly alms round, when they receive offerings from the community and give blessings in return. The monastery dogs howl as Ven. Dhammananda leads the monks out the gate. It’s an almost silent procession. The monks wear identical flip-flops on their feet and walk quietly in single file. One follows with a white cart to collect the offerings. They only stop when they are invited to. Even if someone is standing on the roadside, holding out a bowl of rice, they don’t assume it’s for them until it’s offered. There’s no preaching. People bow their heads as they offer containers of freshly cooked food. I can smell basil, chilli, coriander, lime and jasmine rice. A frail, sinewy woman in a wheelchair clutches a teddy bear as she receives a blessing from Ven. Dhammananda. Other family members form a human chain, holding hands as if the blessings will travel from one to another like electricity. “There is one particular woman who literally has to touch me after putting an offering. I give blessing, she touches me just to make sure she could rub off something from me. It is very funny. “Religion is never complete without the participation of women. We complement each other. Are you comfortable on a chair with only three legs, when it should be four? This is the kind of education we need for the local people for them to realise that one is missing. This is very important. Ven. Dhammananda leads the monks and nuns home. Some of the monastery dogs have escaped and join the procession. They trot with confidence and take on any of the street dogs along the way. The monks cast elongated shadows on the walls and roads as daylight arrives. Their posture is straight, their hands are clasped. Without the donations from the community, the monks would have nothing to eat. It’s a weekly exchange and demonstration of trust. The monks assist some of the most vulnerable in the neighbourhood and provide a sanctuary for those who seek faith. In return, they are nourished by the community. ?People say all kinds of things but it is only their lips. If you are swayed by what people say then you can never, ever do anything.? Ven. Dhammananda has fought hard to get here. She likens strength to a rice plant that sways above the ground. If the plant is not supported by roots that run deep and wide, it will fall over when the wind blows. Ven. Dhammananda says if women feel trapped by their circumstances, they need the courage and determination to bring change. “My message is this: number one, the way out is possible; number two, you have to start; number three, you have to start now because everyone is waiting for everyone else to start, so it never gets started. You can do it. “I have never been bothered by what people said because I know they are speaking out of their unwholesome mind. People are negative about me but it will eat them up. Negative things never nourish a person so they cannot do it for a long time. You must be certain of this. Negative thoughts will never, ever last. Sally Sara is an award-winning ABC journalist who has reported from more than 30 countries, including Afghanistan, Iraq, Sierra Leone and Zimbabwe.